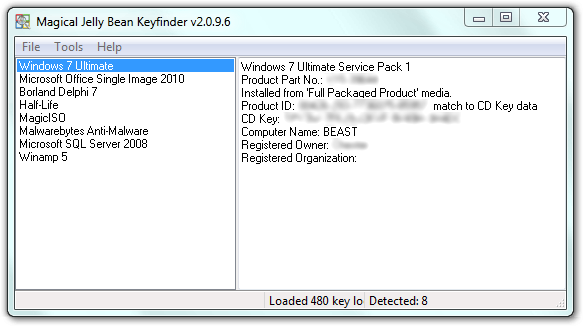 Magical Jelly Bean Keyfinder is a freeware utility that retrieves your Product Key (cd key) used to install windows from your registry. It works on Windows 95, 98, ME, 2000, XP, Server 2003, Windows Vista, Office XP, Office 2003, and Office 2007.
see my post. there are plenty legit reasons to change a key. Why would you need to change the key? Does the older 1.5.1 Keyfinder still work? They still have not put the capability back to allow you to change Windows keys. My previous review stands. App worked great. Migrating Visio 2007 I realized I had no install media and key for Visio 2007 for a client. I re-downloaded Visio 2007 trial from Microsoft's site and used this on the old system and it worked wonderfully. As soon as the functionality is restored to be able to change keys (Windows) I will rate this higher. It's normally a great program, but as an admin, I use this routinely to properly register ghosted machines with their proper keys (off their sticker) to remain in software compliance. For some reason it wont display my 2000 key. Christ this things' been in beta for like 72,000 years. Oh well, at least it works. 4 *. Found a bunch of registration numbers not only for Windows but also : Office XP, Alcohol 120% and Beyond TV. What else does it find? Does exactly what it claims. 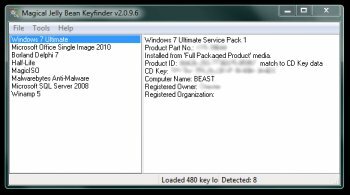 If you want to get your product key for Windows or Office it does not get an easier. This is not a tool for administrators on networks. It makes no claim to be used in this manner and evaluating something based on what it does not do or claim is ridiculous. Excellent tool for personal use.